We first got him to a nice warm cage and offered water and some food and gave him peace, while we made phone calls to our wildlife veterinarians. There was quite a large hole on the top of the shell, but there was also some bleeding from under his right front armpit. When we saw that the bleeding from underneath was not stopping, we decided not to wait til morning, and drove him immediately to Drs. Attila Molnar and Kerrie Milliken's home in Canoga Park. (They are a husband-and-wife veterinary team.) There, on their kitchen-turned-makeshift-hospital floor with plenty of light, we took a close look. It was determined that this poor fellow had been mauled by a mountain lion (no bobcat or dog could have inflicted this much damage) and was lucky that he had not bled to death before he was found. We couldn't have imagined a happier ending, though. 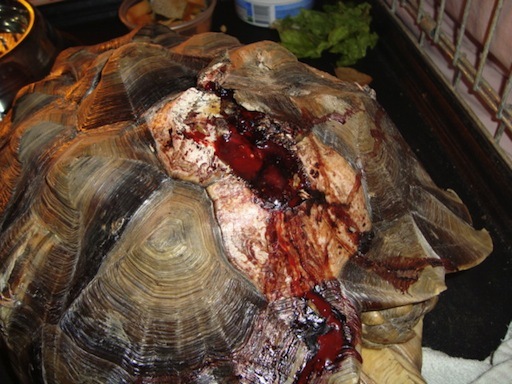 These good veterinarians put their skills together and consulted with others, and managed to fabricate a flexible composite replacement for the missing areas of shell, so that this tortoise could continue to grow and have his home. And then they found a wonderful woman in Malibu with a generous warm heart for tortoises (and a legal license to keep them), and offered to fund his repair and provide him a lifetime home with her. This lucky little guy will live for decades longer and grow to many times his current size... A happy ending indeed!